display to greyscale makes reading from a screen almost as good as reading paper. Are there particular times you like grayscale, or just all the time? Wow, thanks for the reply! The main idea behind flux is to reduce blue light color and intensity, correct? Well the reason greyscale is wonderful (I keep my iPhone on greyscale almost all the time) is that it gets rid of all color, including blue, making working on a computer almost like reading from e-ink (i.e. an amazon kindle). But tinting it would defeat the purpose somewhat. Flux already gives us the ability to tint whites (by which I assume you mean control color temp and brightness). Greyscale should be independent of these controls to give the user the ability to choose the best visibility based on the nature of their computer work etc. Ideally, flux would provide a toggle (with a customizable keyboard shortcut to turn it on and off) that simply turned on/off greyscale for the entire screen. The other flux controls would remain as they are, independently adjustable. Even better, greyscale should be excluded from the ‘disable for one hour/disable until sunrise’ options, because as a simple toggle, it can easily be turned on and off independently, and there are some visual situations where you need true color temperature and brightness, but you can still use greyscale. If you google ‘force windows 10 greyscale’, you’ll get a sense of how complicated this is for windows users presently – you have to edit the video card settings, and it can’t be toggled on and off. Adding this feature to flux would be an absolute game changer to eye strain for windows users! And no, I don't think greyscale should be scheduled (or you could include it as a check-box option to schedule it between certain hours if you wanted). But the simplest thing would be to just leave it as a toggle that stays on until you toggle it off! Well no, not really - blue and green light are part of a white page, and desaturated white is exactly the same as regular white. Gotcha. Well at any rate, you get the idea! Will I know at some point if flux develops this, and if so, when it's released? @austinbio1 we've had a version that does this for a long time, maybe we'll ship it sometime. @lorna I hope you do publish that version soon! Don't hesitate to do so. You could always keep the old version available too. Is there a way to be informed when it comes out? Is there a flux announcement newletter signup? 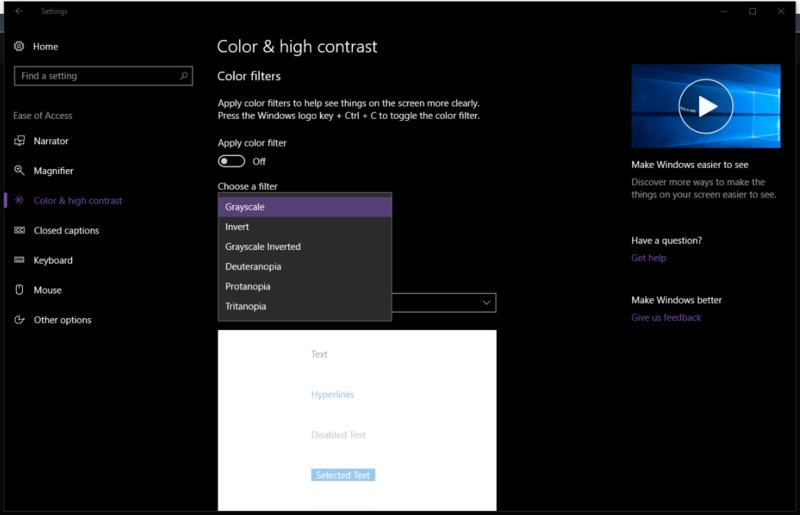 Grayscale option along with other color tints (not part of "Night Mode") is being added to Windows 10 in a very near future update. Currently it is in beta versions of Windows. You can use that until such options is available in f.lux. @NazmusLabs Thanks, but unfortunately that's not available with my version of Windows 10. Hopefully f.lux comes out with one soon. Thanks!